Officials in Europe and Turkey are hailing the apparent success of the first week of the implementation of the EU-Turkey refugee deal. The number of migrants arriving in Greece from Turkey is down to hundreds per day, rather than thousands. Also this week, two boatloads of refugees from Greece have been shipped back to Turkey — 54 on Monday, 120 on Friday. However, some analysts are saying that this is all symbolic, a meaningless show. The reason is technical, but dispositive. All 54 of the migrants returned to Turkey on Monday were Pakistani. Most of the migrants sent on Friday were Pakistani, and others were from Egypt, Afghanistan, and Iraq. None of these migrants had applied for asylum in Greece because their intention was to continue their journey north to Germany or Sweden, an objective that is now denied to them because the “Balkan Route” has been closed. Now, the problem with this situation is that it was already perfectly legal for Greece to deport these 174 “illegal migrants,” even without the EU-Turkey deal. Under a previous 2002 deal, Greece could have returned them to Turkey. Even without that deal, Greece could have deported them to their home countries. As things stand, Turkey will now deport the 174 to their home countries, the countries that they had already fled from at risk of their lives. This asylum hearing process is an enormous logistical problem. It requires police, case officers, judges, and language interpreters. It can take weeks or months to reach a decision on a single asylum application. Greece itself does not have the resources to implement this process. The European Commission has promised that it would send 2,300 experts from other countries to help with the logistical challenge, but those experts are still nowhere in sight. There may be still more problems. The 174 migrants who have already been sent back to Turkey did not put up any resistance, but with 3,000 migrants to go, that may not last. There have already been riots and confrontations between police and migrants in the Idomeni refugee camp on Greece’s border with Macedonia. Make sure that no violent incidents take place among you. There is nothing to be divided. You all share common problems. Hate and violence do not help in any way. The port of Piraeus cannot host you anymore and you have nothing to win by remaining here. Additionally, from now on the port of Piraeus will have to service significant volumes of traffic of vehicles and passengers. It is not possible for you to stay at the port of Piraeus anymore. In a few days the port of Piraeus will be emptied (evacuated). There are legal challenges being raised on both sides of the EU-Turkey refugee deal. European experts are arguing that Turkey does not meet the minimum requirements to be a “Safe Country of Origin.” This concept has been debated by the European Commission, but they have been unable to precisely define what it means, or to produce a list of safe countries of origin. By agreeing to the EU-Turkey deal, the European Commission is deciding by implication that Turkey is a safe country of origin, which means that migrants can be sent back to Turkey, according to EU law. But some human rights organizations are going to challenge that decision in the European Court of Justice, based on the number of times that the European Court of Human Rights has condemned Turkey for breaches of human rights. The trial might delay further implementation of the EU-Turkey deal, and if the ECJ rules that Turkey is not a safe country of origin, then the deal may collapse completely. 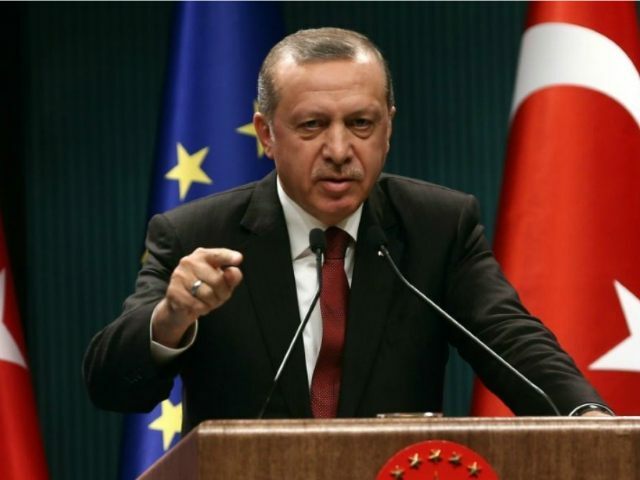 On the other hand, Turkey’s president Recep Tayyip Erdogan is warning that the EU is already in violation of its side of the agreement, and that if further steps aren’t taken, then Turkey will terminate the deal. Visa liberalization: Turkish citizens will be able to travel in the EU without a visa by the end of June 2016. The EU will pay Turkey 3 billion euros in aid for refugees, disbursed as quickly as possible, followed possibly by another 3 billion. The EU was supposed to have already paid a portion of this aid, but hasn’t. The EU and Turkey will “reenergize the accession process” to make Turkey a member of the European Union. Everything that has been promised [must be put into action by the EU], everything that is specified under the accord. [Referring to the aid for refugees], some three million people are being fed on our budget. There have been promises [of aid] but nothing has come for the moment. We have received lots of thanks for our action on the refugees and in the fight against terrorism. But we are not doing this for thanks. Everything should happen in line with what has been promised, what has been set out in the text. There is a lot of opposition in Europe to approving the visa liberalization, which would allow any Turkish citizen to travel freely around the EU. This must be implemented by June, according to the agreement. There is a lot of opposition in Turkey to taking back any migrants from Greece. It is thought that the only reason that the EU agreed to the deal is because the migrant situation has made them desperate, and the only reason that Turkey agreed to the deal was to get leverage to force the visa liberation and to force further steps to be taken in the accession process (not to mention the six billion euros).